From reducing homelessness to better public transportation, Los Angeles County is making progress in many areas—but challenges loom as the county considers funding for future projects. 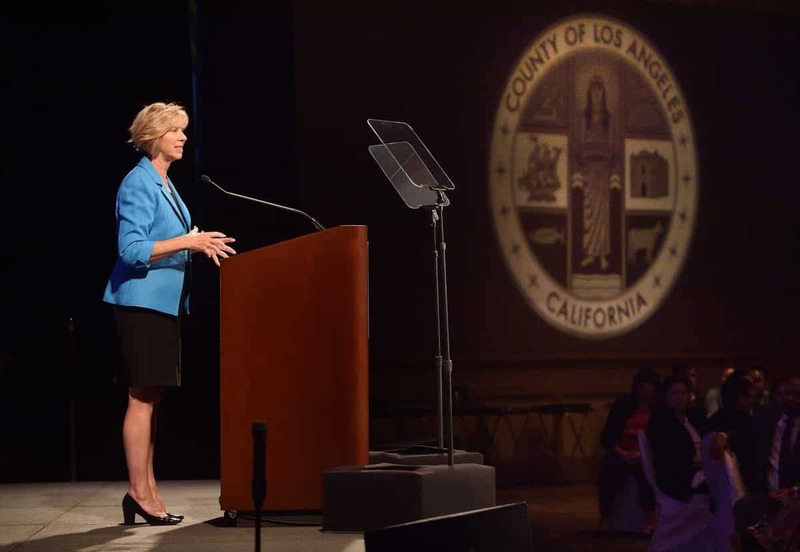 That was the message from LA County Supervisor Janice Hahn as she presented the 2018 State of the County address at the Long Beach Convention Center on Thursday. Hahn is a former congresswoman and LA city councilwoman who was elected to represent the county’s 4th District, which includes Long Beach, in 2016. In her address, she noted projects large and small that have improved the quality of life for residents throughout the county. For one, Hahn said the county this year passed a $32.8 billion balanced budget that includes more funding for small businesses. But a major challenge will be finding the funding to revamp the Los Angeles County Fire Department’s aging infrastructure as it battles record fire seasons each year, she said. “How we pay for it is something my colleagues and I are going to have to grapple with,” she said. While the homeless crisis continues to be the “most difficult” challenge, Hahn said the county is making gains thanks to funding from voter-passed Measure H.
Supervisors, she said, are already making good on their “bold promise” to house 45,000 people in five years with Measure H funding. Hahn said the affordable housing shortage remains a problem in the county, but Long Beach has led the way in its efforts to build more affordable homes. “I will continue to hold up Long Beach as a model for the rest of the county to follow,” she said. Hahn also touched on the county’s major efforts to expand and connect its railways to alleviate freeway congestion. One project, called Twenty-Eight by ’28, aims to complete 28 major road, transit and bicycle projects before the 2028 Summer Olympics. Hahn noted the eight-month, $1 billion makeover underway for the Blue Line, the county’s oldest light rail. The closures next year will take place in segments to minimize rider impact. “I know this is a huge hassle for Blue Line riders and we’re offering three types of shuttles to make it as painless as possible,” she said.